Thank you all for the kind and supportive comments you left on yesterday’s post. I didn’t know such a thing as donkey roping existed. That’s awful. What can be done? 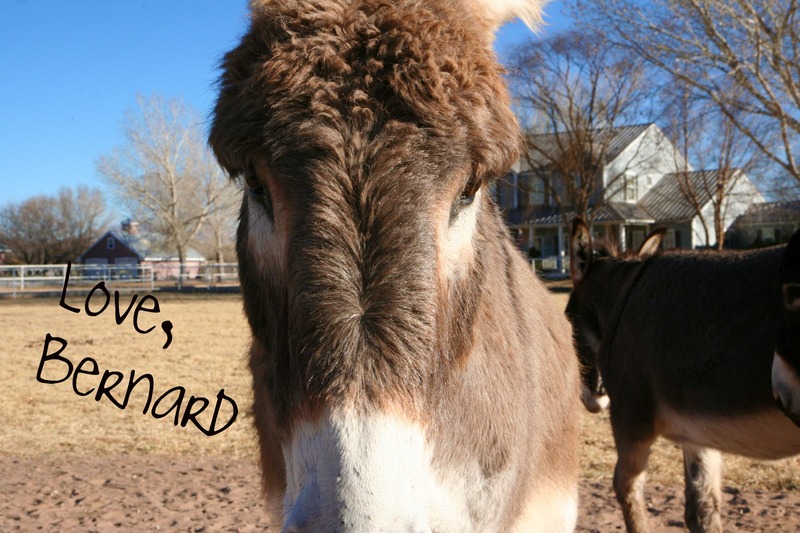 Bernard would make a great poster child for loved donks! Tell Bernard and his brothers that we will NOT forget about his poor little ‘cousin’ that is being abused. Let us know what we can do to help when the time comes. Bernard, we want all donkeys to be as happy and inspiring as you. Your Team Roping Donkey post is on my Facebook page for what it’s worth. Let’s hope something good comes from spreading the word. Don’t forget George, Alan, and Lucy! Like Cyndi, I couldn’t even comment or think too hard about it b/c it might break me. The cruelty out there to animals and children is just oppressing. I never knew such a thing existed either (as the roping donkey). Happy Friday to you and your crew!! Is there any site or organization that we can comment to???? We’re still working on it. I promise to keep you posted.